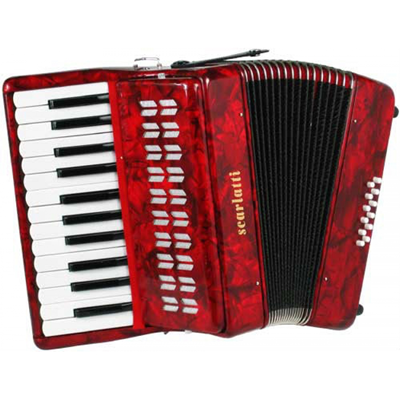 Learn to play the piano accordion with the standard stradella bass system. These half-hour, one-on-one lessons are designed for ages 10 and up, from beginner through at least intermediate level. Students must bring their own accordion for the lesson. 12 bass accordions are recommended, but not required for beginners until they are ready to master the 120 bass accordion. Lessons will be rooted in the Palmer-Hughes Accordion Course, which presents a thorough understanding of basic music concepts, along with learning a variety of music styles. Affiliated individual music selections will be included periodically to enhance the learning experience. Students can expect to learn music theory and scales, read music and chord charts, and create a repertoire. To promote good musicianship, students are given the chance to thoroughly absorb each new idea before another is introduced. Interest is created by an emphasis on playing tuneful pieces, many of which are familiar. Advancement depends on the student's dedication. My goals as an instructor are to help you become a well-rounded musician able to play confidently in private or public, and to help you discover your potential and to foster an appreciation for music and the accordion.